So, an author friend of mine is getting ready to have her next release published. Last week, she posted images of several cover designs that she is considering. I let my opinion be known only because she asked for some feedback and I understand the value of feedback with regard to publishing. It got me to thinking of the cover design of my 2nd publication, Short Stories: Lessons of Heart & Soul. I decided that it was time to make a change to the cover. I love the cover image but the font of the title has been problematic in a digital format. I didn’t foresee the kinds of problems I am having with it. For the title I had chosen a font that is in script. Esthetically it looked good with the cover image but it was not a good decision on my part because it is not very readable digitally. So there has been a slight revision to the appearance of the e-book cover of Short Stories: Lessons in Heart & Soul. Here is a before and after. You’ve gotta love e-books, it’s so easy to make changes. Download a new version of a cover or revised text and you are all set. Not much more than a click of a mouse and very little expense. Chalk up this necessary revision to lessons learned in digital publishing! Since e-books are still undergoing tweeks in development I’m not the first to encounter this problem. Here is a good article about e-books and fonts. See you back here tomorrow. This blog is brought to you by award-winning author Sue Batton Leonard. On this Thirsty Thursday the topic is curious seniors who are opening themselves up to a whole new world of information by learning about computers. In the documentary film, Cyber-Seniors, teens pair up with elderly people to teach them the most popular ways of communicating digitally, how to search the internet for information and about Facebook and You Tube. It open ups new avenues to explore and things to talk about with their grandchildren and family. As you will note, for most seniors the only challenges in using computers lies between their ears in their attitudes. But, that’s no different than all of us, is it? No matter what stage of life we are in! On this Thirsty Thursday, meet some Cyber-Seniors who are bridging the gap between generations and having a little fun doing it. You’ll enjoy these one minute videos and the full length documentary is available here. Are You Tweeting with Happiness? A few weeks ago as I drove 388 miles south along I-25 between Denver, Colorado and Albuquerque, New Mexico I heard a story on National Public Radio’s (NPR) All Things Considered about human behavior and social media that peeked my interest. It was a timely delivery of a story because it gave me something to ponder in my boredom. Did you know social scientists are studying the mood of the planet through individual’s activity on Twitter? Rises and falls in biochemicals which affect circadian rhythms may have something to do with how we feel throughout the day. Scientists say by reading an individual’s tweets, they can follow people’s mood changes throughout the day. There is a rise in positive tweets first thing in the morning and then late at night . 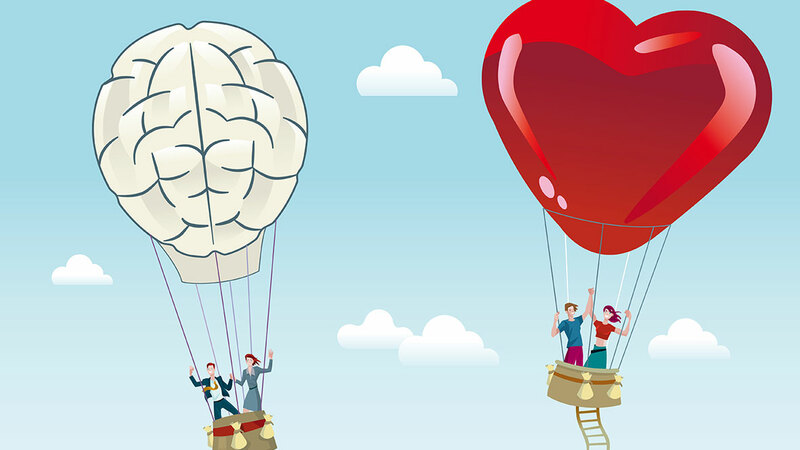 Do you think reading people’s emotions through their activity on Twitter is constructive or destructive or just a time waster? In my opinion, also tracking seasonal differences in atttitudes would make the research more credible because seasonal affective disorder has very real symptoms. I’d like to hear from you about the validity of a study about Twitter “tweets.” Post a comment. My dad was a custom home builder, as was my grandfather, my great grandfather and now my two brothers and my nephew. 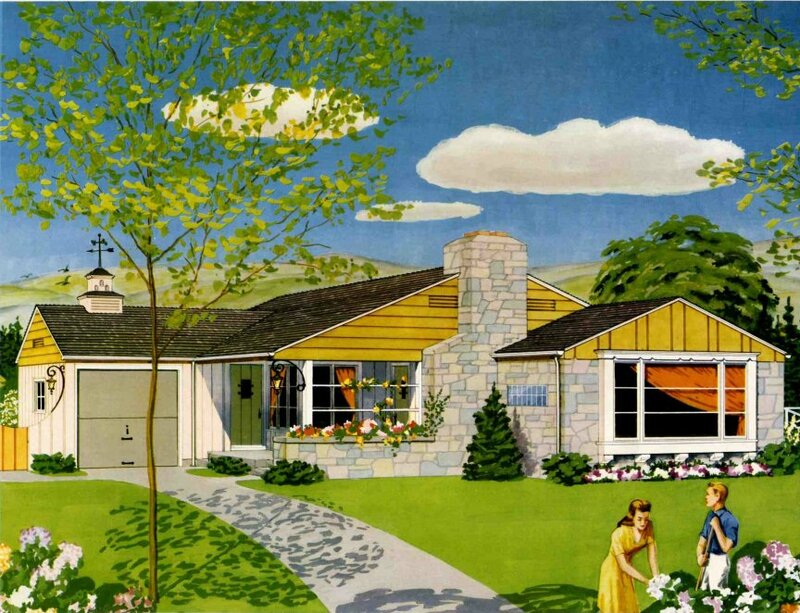 When I came across these vintage home pictures from the 1950s and 1960s, they stirred nostalgic feelings of an era past. 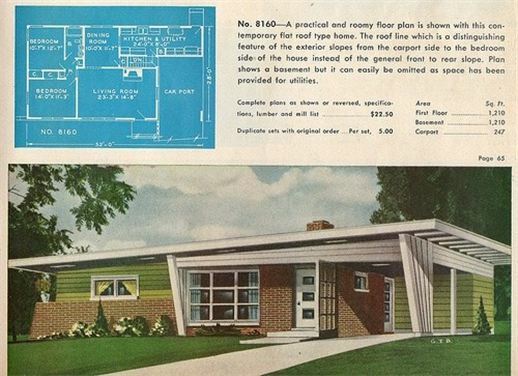 The images reminded me of all the times my Dad came home with a new set of blueprints, and unrolled them on the kitchen and dining room table and explained the layout of the different styles of houses to us kids. 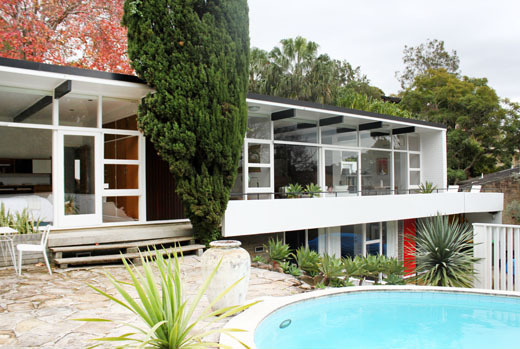 I was always interested in seeing them and tried to envision the houses when completely constructed. I came to know what markings were used to show where the doors and windows would be placed and whether they’d swing in or out. 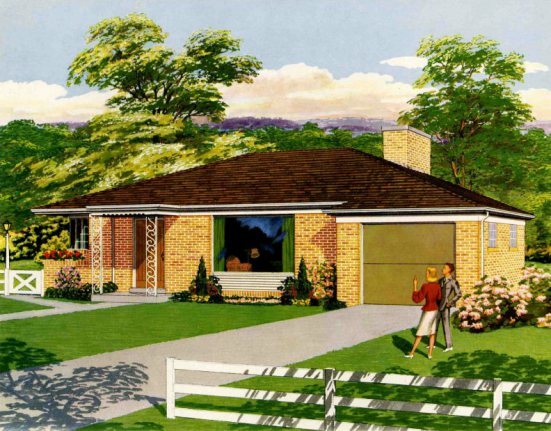 Other sets of plans showed where the beams and the roof trusses ran, and kitchen layouts. It makes me happy that my Dad took time to explain all that, because now I have a basic understanding of what I am seeing when I look at a set of building renderings. 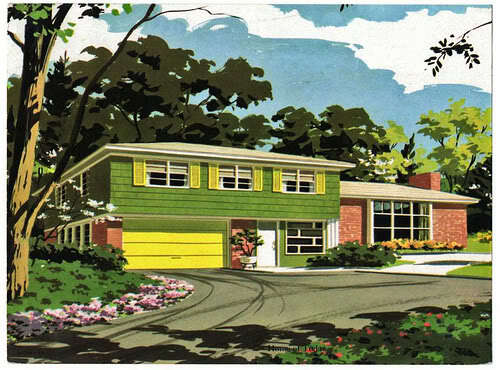 Back when I was a child then there were no CAD (computer assisted designs) or drawings. Each set of blueprints were painstakingly hand sketched using drafting tools such as protractors, rulers, t-squares, tracing paper and more. Trying to make changes to features in rooms and design was so tedious. 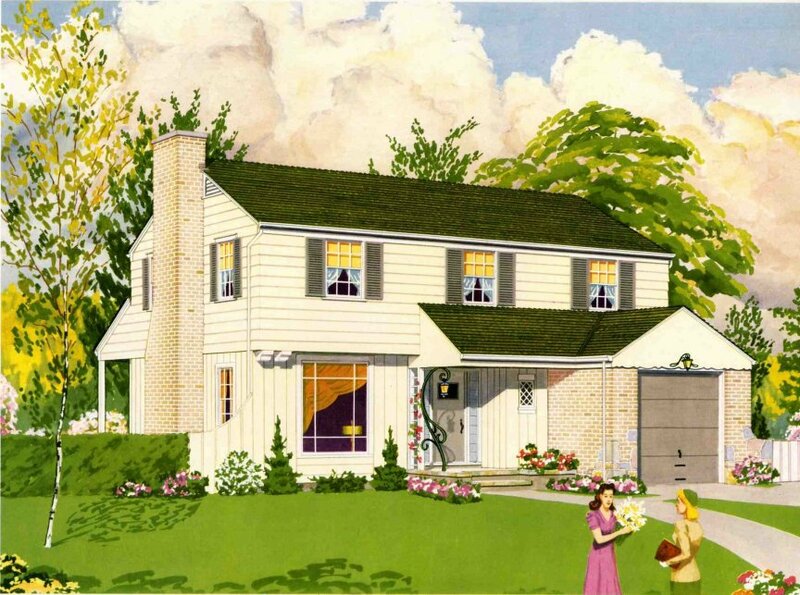 The reason I am sharing this information today is because many baby boomers might find fulfillment in seeing these home designs of the 1950s and 1960s.You or a neighbor may have lived in a house just like them! Enjoy, and do return to All Things Fulfilling tomorrow. We often dig into the archives and find things to talk about that stir fulfilling memories for other people. Whether your childhood was spent in a big home or a little home – what unites happy families are the relationships that exist between the spaces. Where is your tech support person when you need him? Weeks ago my husband and I moved,and getting digital equipment reconnected is time consuming. 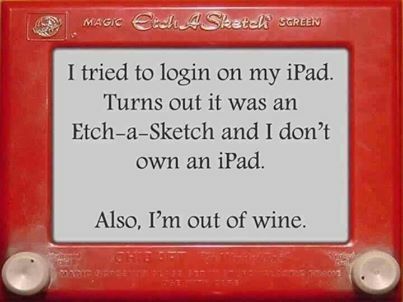 I remember when the Etch a Sketch came on the market in the early 1960s – it immediately went to the top of my Christmas list, and Santa fulfilled my wishes. 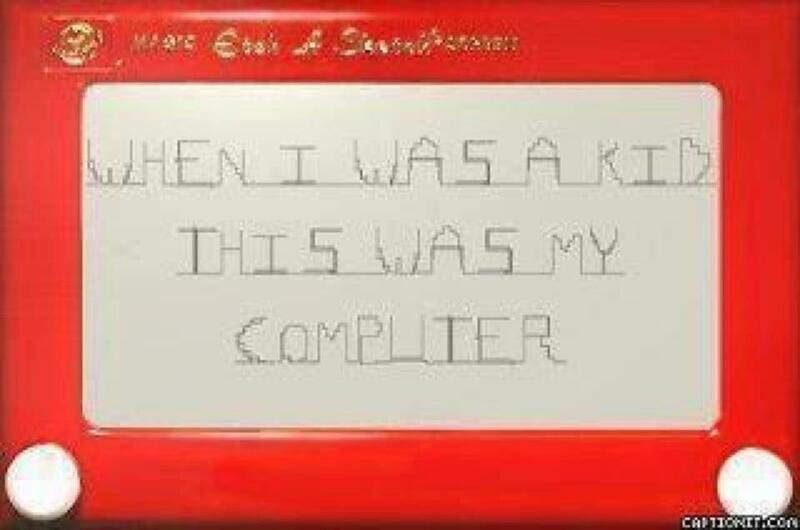 The Etch-a- Sketch was our traveling companion. It kept us kids entertained and from fighting on road trips. 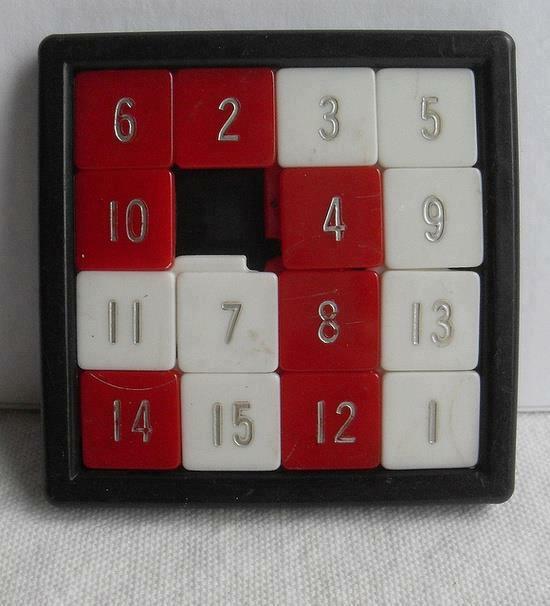 The other toy that was a saving grace in the car were these number puzzles. Remember them? We also had a larger one with a U.S. Map on it that you had to unscramble- that was very challenging. It’s fun to look back on old toys from my childhood. Some of them make me wonder if kids today would even know what they are or take interest in them. 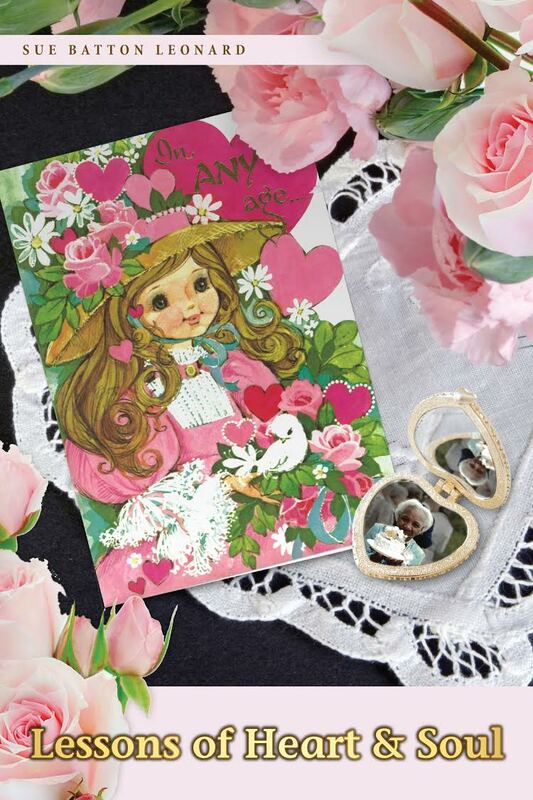 If you are from the baby boomer generation, what was your favorite plaything that you wish you could still locate today? Search, you might find it here http://www.vermontcountrystore.com. Tomorrow it’s time to head to Denver for Saturday’s monthly CIPA meeting (aka Colorado Independent Publishers Association). This month’s educational focus will be on social media marketing – attendance should be high. There are so many authors and publishers who want to know more about selling and marketing books effectively over the internet. I will be heading up a roundtable discussion on Taking Facebook to the Next Level, beyond the basics of using Facebook to promote independent publications on the world-wide-web. I am looking forward to sharing my knowledge. I’ve got my work cut out for me on the three hour drive from where I live to Denver. I will be listening to my own audio book recording of “Gift of a Lifetime: Finding Fulfilling Things in the Unexpected.” The recording has been edited but I’ve not had the chance to listen from beginning to end for any glitches. This is a good time to give a shout out to ColoradoMountainCollege student, Bryan Dow, who was so helpful to me throughout the recording process. He edited my audio recording quicker than I could have ever expected. It was his first job at editing an audio book, but he has a wealth of experience with the program. Among his already deep curriculum vitae “c.v.” is the title” musician” so uses the software frequently. I enjoyed getting to know this college student a little bit. Someday I hope he tells his own story through an independently published book, film or music or perhaps a multi-media publication. He is working on a fascinating project, while trying to balance a busy schedule of work, study and building a future for himself. It’s a wonderful thing to have people in this world who are whizzes with technology and can do great things with their hands, creativity and intellectual talents. Thanks again, Bryan, for lending me a hand, and helping me with the production of my audio book (in MP-3 format) “Gift of a Lifetime: Finding Fulfilling Things in the Unexpected.” You are a person who can help build community in many different ways with your diverse talents. I am glad our paths crossed. See you back here on All Things Fulfilling on Monday! This blog brought to you by www.CornerstoneFulfillmentService.com.